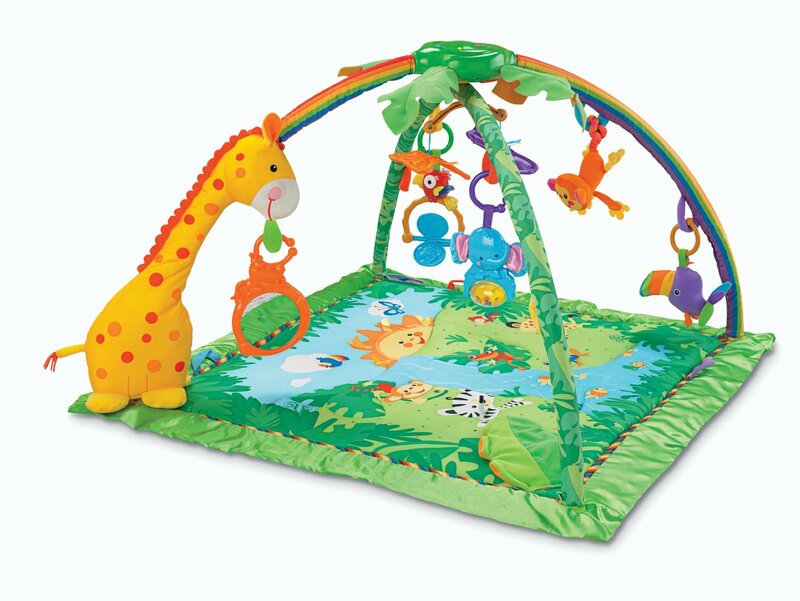 The Fisher-Price Rainforest Melodies and Lights Deluxe Gym was a big hit for our son. He spent a lot of time laying under this as an infant swatting and kicking at the toys and staring at the lights. For us this toy was especially important for development due to an injury my son ended up with at birth, leaving his left arm weak at the earliest stages of life. (Thankfully he has recovered completely and is an extremely strong little man!) Seeing him lift his arm to reach for the toys as he regained his strength day by day was wonderful. I also liked this toy because it entertained him for long periods of time (in baby minutes.) The lights and music, along with the moving butterflies kept his attention well, and the spinning and rattling toys were particularly attractive to his developing mind. I would recommend this activity gym for any newborn. It is currently being used by a cousin’s newborn son, who also gives it a high rating!